Get set and ready to fly! The Government of India has taken a revolutionary step in making the dream of a common man to fly a reality. Till now, taking flights was considered a privilege for the rich and wealthy. 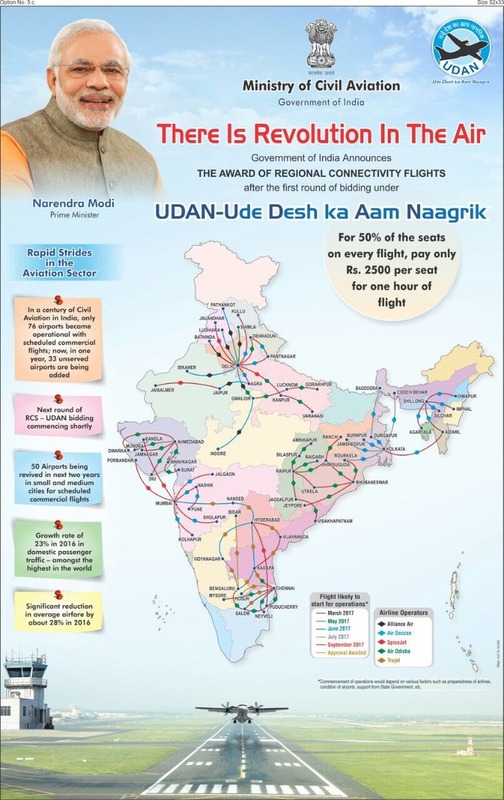 However, with the UDAN initiative (Ude Desh ka Aam Nagrik), the Indian government will now make sure that every citizen can afford to fly, albeit to nearby destinations. 50% of the seats in these UDAN flights will cost Rs 2500 or less! In order to connect the country’s unserved and under-served airports with the major ones, 5 major airlines- Air Deccan, Spice Jet, Air Odisha, TruJet, and Alliance Air have won the bids to operate on as much as 128 routes, thereby connecting 70 airports of India. These 45 routes have already been approved by Union Aviation Minister Gajapathi Raju. According to him, all these flights will be fully operational within 4 to 6 months. He also expects a direct effect of this action on the economy by the increased employment. This has come as a pleasant surprise for budget travelers. In this fast paced world, people try and travel as much as possible (which is usually on weekends). Now, you don’t have to wait for that ‘long weekend’ to pack your bags. You can take any of these flights and save both, your time and money! Is there better deal than this? We don’t think so! Love the Himalayas but not the long bus rides? UDAN has something for you too! The amazing flights from Delhi to Shimla and increased frequency of flight from Delhi to Bhuntar (Near Manali) will take you right in the lap of Himalayas. There is a flight from Delhi to Pathankot as well and the Kangra valley is then all yours to explore! In addition to this, there is now a direct flight from Jaipur to Jaisalmer! Could this get any better? What are you waiting for? Keep a tab on the UDAN project and keep up your excitement for the tons of impromptu trips ahead.